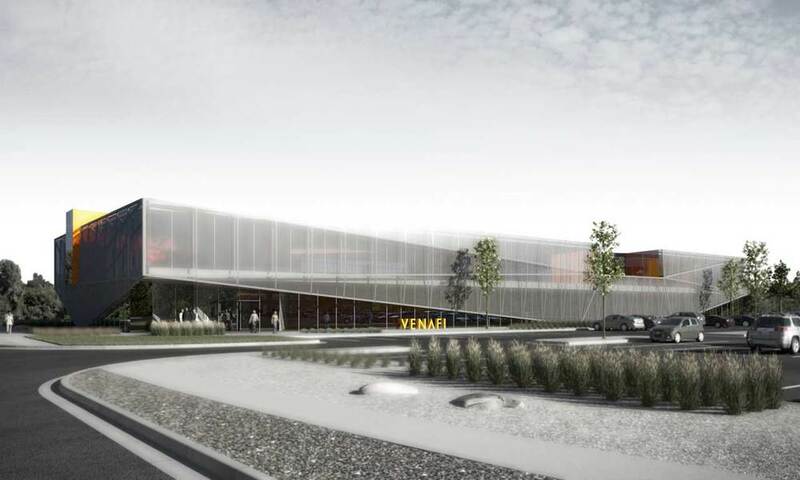 Global internet privacy and encryption management leader Venafi has selected a design by SSC_A for its new "Silicon Slopes" headquarters. The project deals with the constraints of the shoebox-scaled site through a series of maneuvers that play a subtle homage to the site's former use. Located on heavy industrial land historically occupied by the now-defunct US Smelting and Refining, the low diagonal forms of the steel mesh second-skin offer an abstract material and geometric reference to the long sloping conveyor belts of the previous industrial complex, while providing the building a visual lightness that helps camouflage its unusual proportions. A recent EPA Superfund site, this leap-frogged location in an otherwise densely developed city offers a unique alternative to greenfield office development at the fringe. The design of the new building will help shape a radical redefinition of Venafi's company culture. Currently organized by department, the company will completely reorganize its team into smaller interdisciplinary "neighborhoods," and hard-walled offices will be eliminated in favor of a horizontally organized open workspace that is unflinchingly egalitarian. Neighborhoods are clustered around small squares, with lounge, play, hotel, and meeting spaces, with the entire space organized around a central Agora - a semi-autonomous double-height form lodged in the center of the project that allows for all-staff meetings, parties, and chance encounters. An on-site gym and showers, ergonomic desks that move from standing-to-seating height in seconds, native landscaping, and direct ajacency to a stop on the city's new light rail line all contribute to Venafi's rigorous focus on a healthy and sustainable workspace.